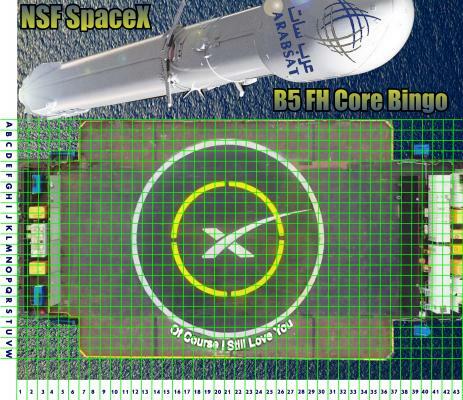 NSF SpaceX ASDS Landing Bingo makes a rare return for the launch of SpaceX's most powerful ever rocket! Just over one year ago the space world stood in awe as the land and sky trembled under the thundering triple exhaust of the debut flight of the world's most powerful operational rocket. Two veteran block 3 boosters bolted to a brand new core vehicle inaugurated the concept of the Falcon Heavy, promising to outlift and outprice the rest of the world. The boosters did their job, returning for their unprecedented synchronized landing at the Cape's LZ1 and LZ2, while the core vehicle roared forth hurling the second stage and Starman, in his cherry red Tesla Roadster on a path beyond the orbit of Mars. Alas, the robust Heavy Duty FH center core, targeted to land out to sea with OCISLY ready to catch it, was unable to reignite all three of its engines for the landing burn and plunged to its high speed demise in the deep. Time passed, data was analyzed, materials gathered, work commenced and now once again the Falcon Heavy is set to rise, this time with three brand new build bodies of Block 5 design making the Arabsat 6A flight the most powerful SpaceX has launched to date! OCISLY has set sail enroute to its most distant point ever ready to catch the highest, hottest and fastest at sea core landing yet, a momentous occasion, so once again the game is afoot! No shotgun start, the game is immediately open! The game remains exactly as played in prior iterations. If its not broke don't fix it. Pick your square, one per player. Closest square to the center engine when it comes to a halt gets the prize! This includes post landing walkabouts, or Octocrabber nudges! No prize for fireballs, debris, or damage on deck! If it hits the ship, goes kaboom, punctures holes in the deck, falls over in transit, there is no winner. Only a booster standing tall and triumphant as the ASDS sails into the harbor will generate a win! NOTE: There may sometimes be a slight delay of a few minutes at most between scraper updates, so check the last few posts before yours too, just to be sure. Scraper is operational as of this edit. Thanks to DanielW for setting the scraper up, it helps a lot! Judging is by me, Helodriver using imagery of OCISLY sailing back into the harbor to help determine a winner. Rocketcams, helicopter or drone shots, and landing coverage will also be used, but where it sits at the time of unloading will be final. Winner gets a SpaceX artifact, which has been recycled from its original purpose into a suitable prize. Winner also gets a one year L2 membership for free! If a current L2 member, you can donate it to another member or add it to your own term length. The winner will also get a signed original picture of a SpaceX vehicle taken by me, suitable for framing. Good luck SpaceX, Good luck B5 FH, and Good luck to NSF readers! K19 please and thank you! Scraper is currently wonky, This thread is the official record of picks, first come first served, no duplicate picks! Check this list carefully before choosing as no edited picks are valid. P21, and my first post! I will take N22, please. Let's hope we get a center core back in port. still wonky on the scraper.